Since the Olympic Night match announcement on November 19th or thereabouts, we'd had a few new team members added and a few exhibition games under our belt. 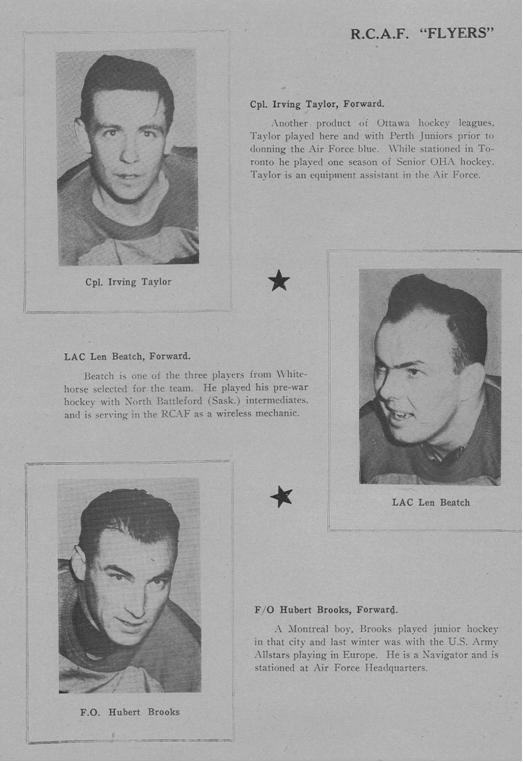 This would be the first game however that we'd play without our RCAF professionals; Frank Boucher and Stan Rooke. 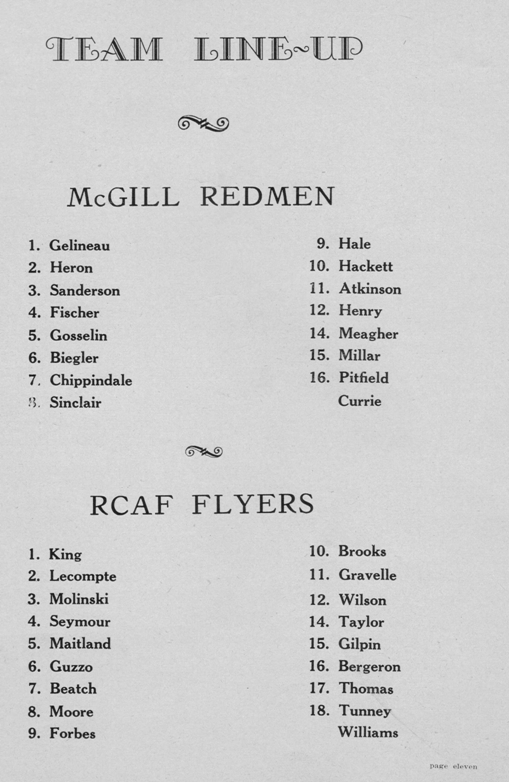 This Saturday Olympic Night, December 13, 1947 we were to play the McGill Redmen leaders of the Senior Intercollegiate League in what was billed as our first formal game as the RCAF Flyer team. It was at this game that the RCAF Flyer team were expected to showcase our talent and hopefully fulfill the expectations of our benefactors and supporters. 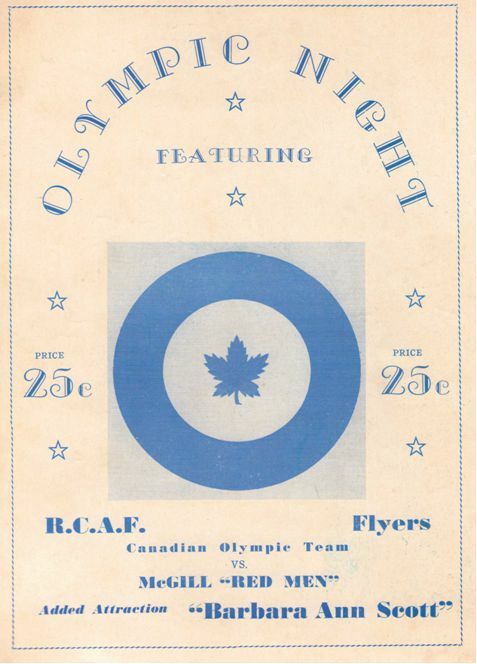 Proceeds of the game were to go towards the Flyer's Olympic Team’s expenses overseas. The day before, Frank Boucher added a new goalie, the RCAF's Joe Tunney of Newmarket, to our lineup. The McGill team was one of the strongest of recent years. 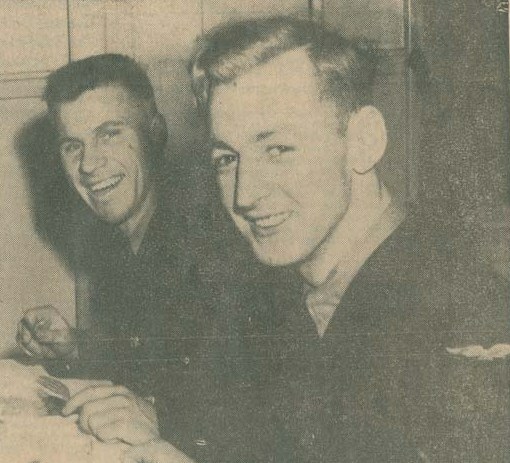 The team had 7 war veterans on the squad and included Cy Biegler, who played pre-war hockey with Boston Olympics; "Goose" Gosselin and Jack Millar. Goaltender for the Redmen was Jack Gelineau, regarded as one of the top netminders in amateur circles (who the following year would win the Calder Trophy as Rookie of the Year fpr the Boston Bruins). Gelineau was an air gunner during the war. Dave Campbell, experienced coach of the Redmen served in two world wars and coached a Canadian service team to a hockey championship overseas. However most of the players acknowledged that they could not qualify to take the Olympic oath. The following "tentative" RCAF Flyer Hockey Team photo was released to the press by the RCAF a few days prior to Olympic Night. For each of the 13 players initially selected the Air Force issued a brief bio. F/O Hubert Brooks, 418 Belanger, Montreal P.Q. is a left winger with a fast shot. This was not only demonstrated on the ice, but he is also one of five members of the RCAF who were awarded the Military Cross during World War II. Brooks was shot down over Germany in 1942 and later escaped twice from a prisoner of war camp. Twice recaptured he finally engineered an escape that took him into Poland where he joined the Polish Underground Army with whom he served from 1943 until liberated by the Russians in 1945. Last year he played with the US Army Allstars in Europe. On the day of the game the Montreal press had a brief photobios on some of their hometown boys - which of course included myself. 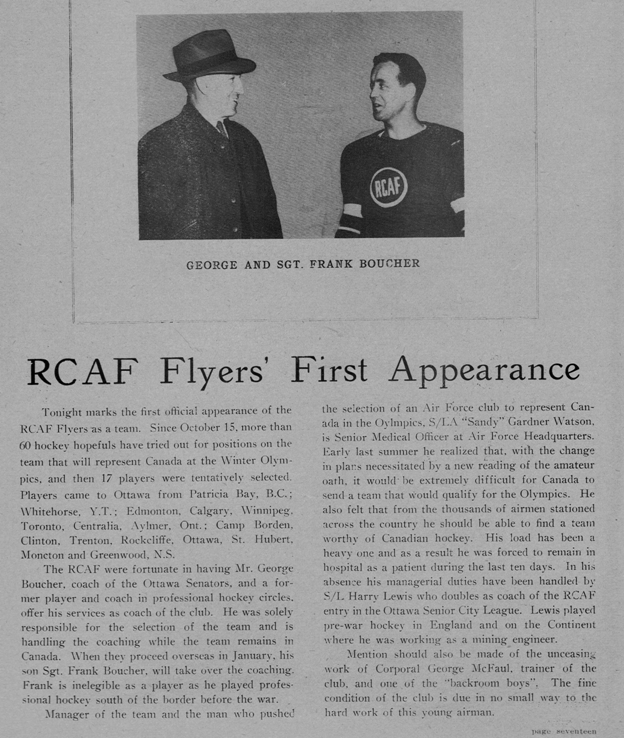 George "Buck" Boucher, Canada based coach of the RCAF Flyers could not be present at the game - for as coach of the Ottawa Senators his prime responsibility was to coach the Senators during a 2 game trip to Boston and New York. 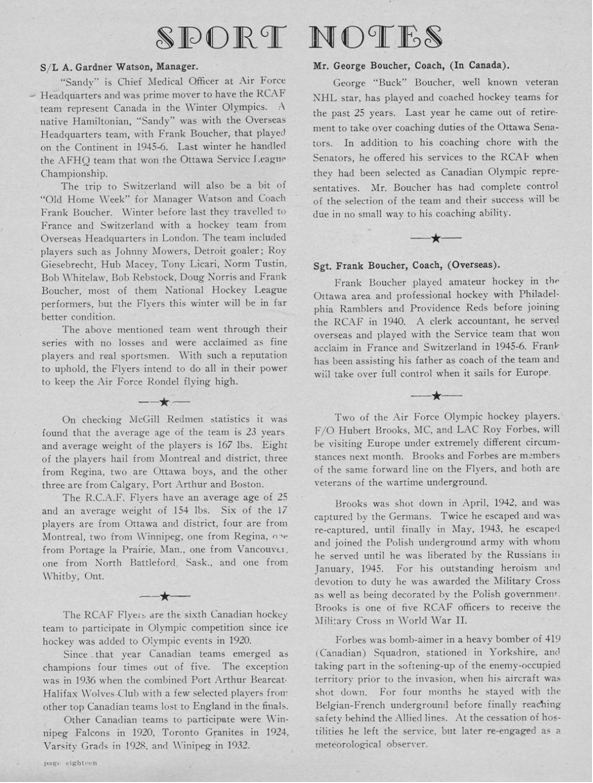 George’s son, Frank Boucher, the coach for the Flyers in Europe, would coach the team for the Flyers first formal opening game. Buck Boucher commented; "that he thought the team was in fine shape reaching its peak form and had every confidence in the team" then left for Boston. S/L Sandy Watson, manager of the Flyers, had been in hospital for the past week, but expected to be out to see the initial test of his Olympic squad. Anyone who was the least bit associated with the R.C.A.F. 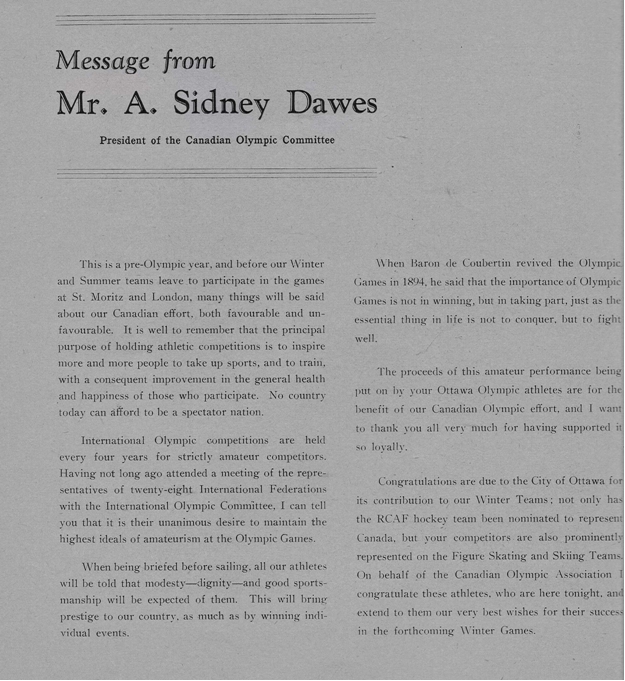 Flyer Olympic Team had a page with a picture and a few fine words of support in the Olympic Night Program – which all would be read again a second time after the game! There were a total of 6 pages devoted to R.C.A.F. Flyers pictures and capsule biographies, 3 Flyers/page. An example biography page that I was featured on is shown below. Just prior to game start, it was announced that indeed we had a full house with 6,500 spectators in attendance. Stan Pratt and Garnie Marshall were the officials. Well – we got creamed! In the end, it wasn’t even close. .
"What is the matter with MY team?" "Sir, if I knew I’d fix it!" It was a scoreless game for the first 18 minutes of play when the Redmen's Hackett banged in a rebound from a tough shot by Meagher. After the first period it was all McGill and became a one-sided game. Despite the final score, our new goalie Joe Tunney played a good game and the score would have been much higher without some of the fine saves he made. Our team just did not give him the defence protection we should have. Tommy Moore and Orval Gravelle had a good game but everyone else was just flat and things just did not click. The final score was 7–0, in favour of McGill. McGill was clearly the better team that night, playing rugged hockey, with solid checks, and speed to spare - which allowed them to continually go in deep for goals - knowing they had the ability to return to catch any breakaways by the Flyers. Yes we were in the spotlight, and yes there was a lot of pressure on us to perform, but when things started to go wrong we simply did not have the skills that night or team chemistry to be patient and play our game. Coach Frank Boucher summed it by saying; "the players did not relax, forgot their combinations and were much below recent form. They had no troubles with Queen's which McGill needed an extra period to defeat." Yes it was true that McGill University had one of the strongest teams that they had had in years, and that they were in the midst of their league schedule and that they were currently tied for leadership in the Senior Intercollegiate hockey loop – but it was more than that. We were simply not cohesive as a team and simply didn’t have the conditioning to keep up with the Redmen. As well, they frankly had some very good players! For those of you that have been in similar situations where results fell somewhat short of expectations, and in a very public fashion, with a number of reputations on the line, you might imagine the outcome. The press had a field day. Those in charge were suitably "shocked and promised swift action". Any positive thoughts that any of us could have taken from the game were quickly quenched when we read what spewed out from the newspapers. 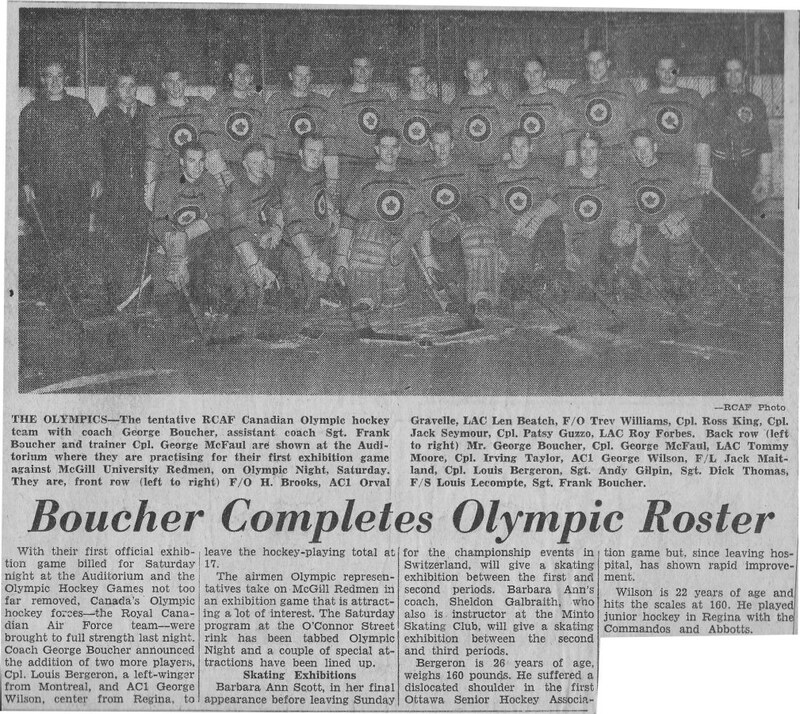 The December 15, 1947 Montreal Gazette had the Sports page headline "TEAM PROVES INADEQUATE for OLYMPIC GAMES"
Ottawa, December 14 - A perplexed RCAF hockey executive and an equally baffled CAHA were wondering today where they could find a hockey team to represent Canada in the Olympic Winter Games at St. Moritz next February. 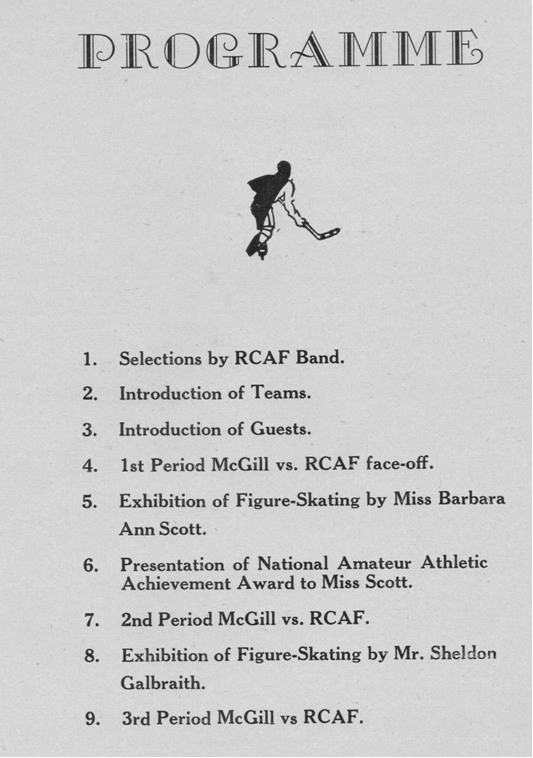 This was the result of the 7-0 pasting a fast-skating smoothly-working McGill hockey team plastered on the RCAF "Olympic" representative here last night at the Auditorium. "Over a roaring fire of comment from one and all, the local aspect of the Olympic hockey pot is rapidly approaching the boiling–over stage. 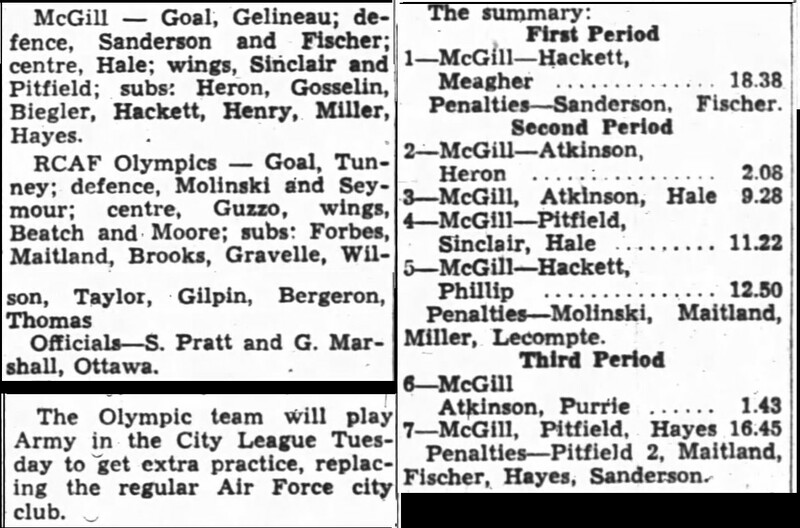 It all stems from Saturday night’s game here, when McGill Redmen handed the Switzerland bound RCAF squad a 7–0 trimming. Reports from all sides indicate that the showing by the Airmen was, indeed a sorry one. .....…. It is our contention that a first class team should go, or none at all. .........The assembling of such a band, however, is no overnight job, nor is it a job that can be crammed into a few days or even weeks........What can be done at this stage – if it is accepted that the present RCAF team is below par – is just another headache for the "Powers That Be". The blame should not be placed on the local RCAF officials, nor the coaches, who have done the very best they could with the material with which they had to work. Fashioning any kind of team from the candidates reporting here was a man’s job in itself. 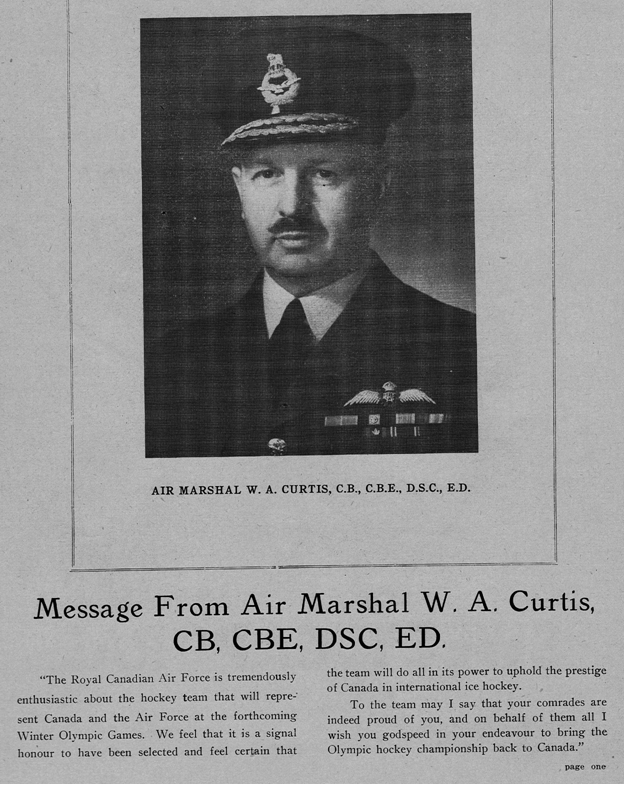 It is our contention that this RCAF team should not have been suddenly dropped into a contest with a seasoned team like McGill in which they appear to have been over–matched. Meantime, the RCAF squad faces the acid test this evening. With opinion strongly against them, and the CAHA officials ready to screen them very thoroughly, they will be carrying a double burden when they skate out against the Army. There is no disguising the fact that the Army would like to have something to say in the matter of the "Air Force only" representation on the Olympic hockey team. And it all adds up to an interesting session at the Auditorium." 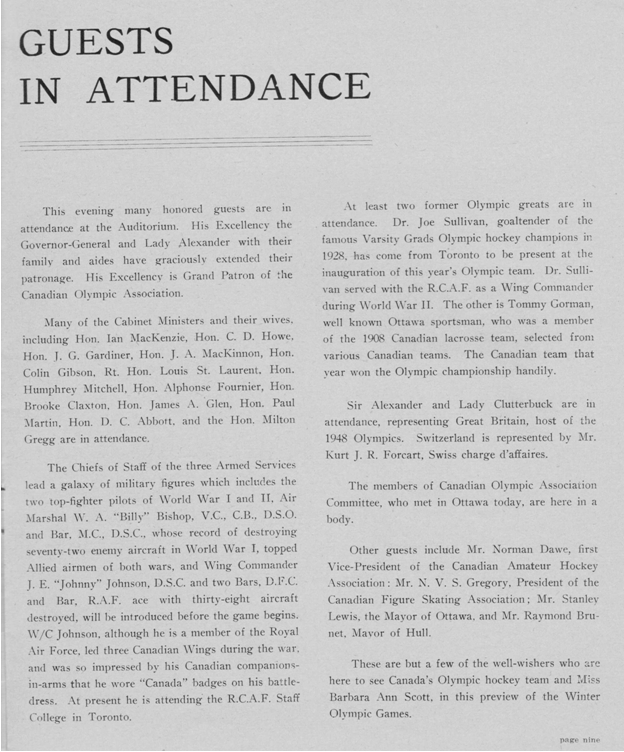 Dudley To Report: Toronto, Dec. 15 –(CP)– George Dudley, secretary–manager of the Canadian Amateur Hockey Association, said tonight he would present a report "by the middle of the week" on the 7–0 defeat of the RCAF Olympic hockey team by McGill University Redmen last Saturday, to the association’s president, Al Pichard of Regina. He declined further comment. Where The Blame Lies Edmonton Dec. 15 –(CP)– The International Olympic Committee was branded "the villain of the piece" by Dr. W. G. Hardy of Edmonton, as the vice-president of the International Ice Hockey Federation commented tonight on Saturday’s 7–0 defeat of Canada’s prospective Olympic hockey entry at the hands of the McGill Redmen. reviewing the dismal showing of the RCAF Flyers at Ottawa. RCAF Team Gets A Second Chance Tonight **** All–Stars May Replace Airmen **** Norman Dawe To See City League Contest ; Montreal, Dec 15 –(CP)– Norman Dawe, vice–president of the Canadian Amateur Hockey Association, suggested tonight that Canada be presented at the Olympic Games by an all–star team picked from college teams across the country. .........Dawe said he had been requested by the CAHA to scout the RCAF team at Ottawa tomorrow night when they play the Army team in the regular Ottawa City League game. .........The CAHA vice–president said the University of Toronto team, winners of the Intercollegiate League title last year, should be given first choice, but in the event players are unable to leave the country owing to studies, he suggested a team be selected from colleges across Canada. No Comment; Regina Dec 15. 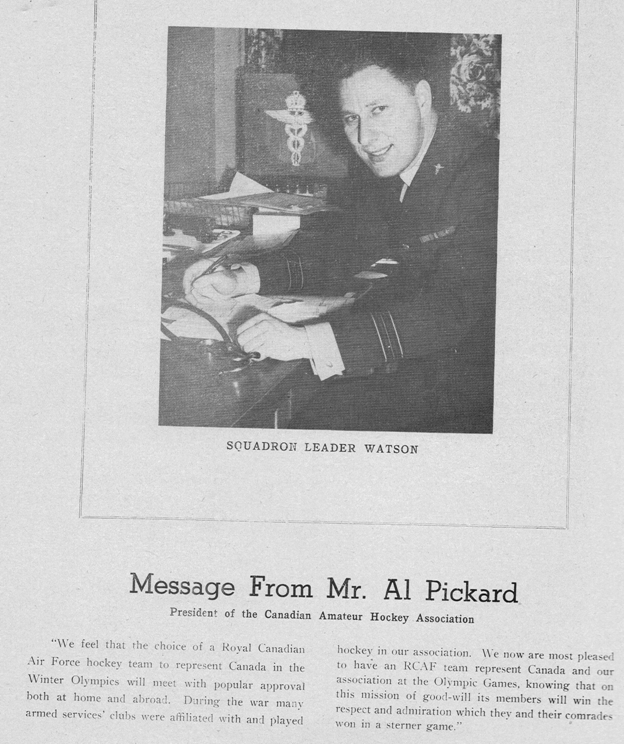 –(CP)– Al Pickard, president of the CAHA, tonight withheld comment on the 7–0 defeat of the RCAF Olympic hockey team at the hands of the McGill University Redmen Saturday. He said he was awaiting a report from George Dudley, secretary–manager of the CAHA. No Comment Will Make Decision After Army Game: The Olympic hockey spotlight swings back to the Auditorium tonight for the second time in the space of 72 hours. 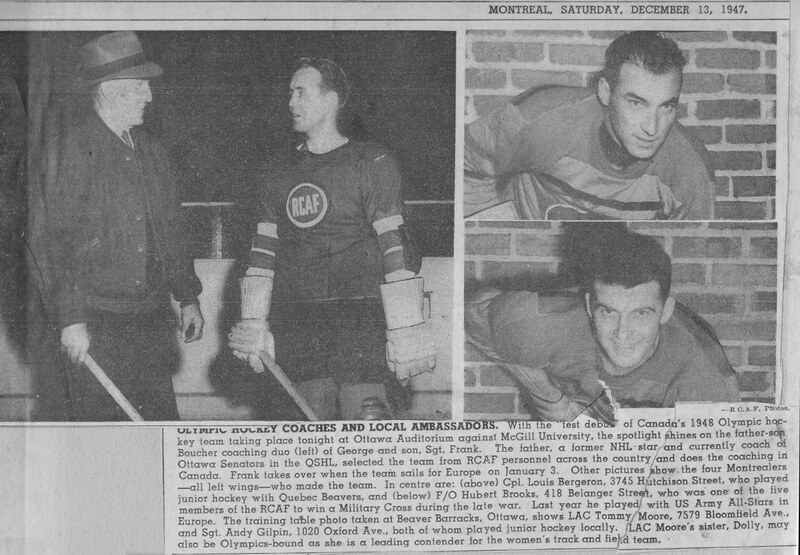 Canada’s RCAF Olympic hockey ambassadors whose dismal showing in the 7–0 setback at the hands of McGill University here Saturday threw the Dominion’s hockey–minded citizens into something of a furor, are going to get another chance, and the Olympic situation is expected to be clarified considerably after tonight’s appearance of the team coached by Frank Boucher. Dawe and Boucher will get together after the game and decide then if help is needed and what will be done. Dawe feels he should get another look at the club before making a decision one way or the other, and feels that the Airmen hockeyists were playing their first important game had something to do with their jittery performance. ....... Should Dawe and Boucher decide tonight that the club needs strengthening, the men in charge will have to move in a hurry. The team doesn’t sail till Jan 9th but this doesn’t give the men in charge much time to play around. It is rather awkward bringing in a hockey player ...... and sending him to the Olympics a couple of weeks later! "I do not know who organized that exhibition game, but we weren’t ready. We hadn’t gelled as a team yet." 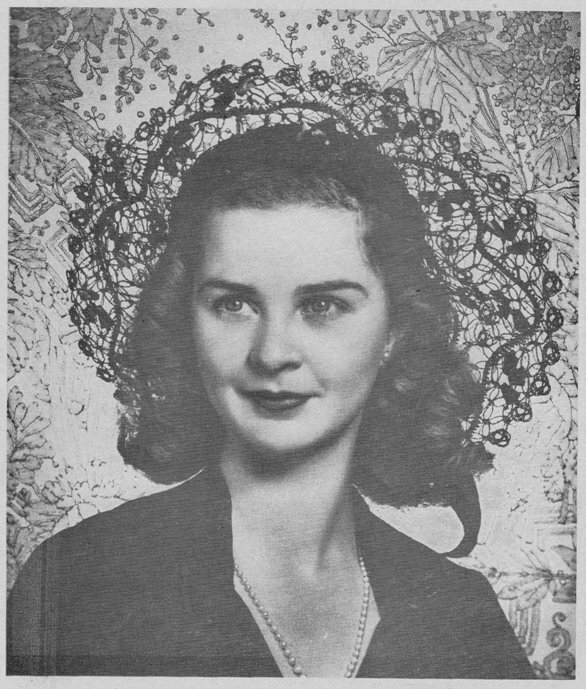 The only positive from the game – as we’d later find out – is that Manager Sandy Watson had obtained a $6,000 appearance fee for arranging for Barbara Ann Scott to skate at half time – something that neither Miss Scott nor her manager mother realized at the time! The outcome of this game, reinforced by the Army Headquarters game which closely followed, set forth a set of actions that few of us could have anticipated.